We use three simple benchmarks to determine whether something is "classical". The first benchmark is age. The second is its ability to cross ethnic boundaries, and third is class associations. *The ability to span different ethnic group – It is an another common benchmark. This is best illustrated by a simple model put forth by the anthropologist, Robert Redfield in the early to middle part of the 20th century. According to Redfield's model, there are "great" and "little" traditions. We may simplify theses concepts by saying that "little" traditions are the folk traditions while the "great" traditions are the classical traditions. The "great" tradition of European classical music was able to span the different ethnic groups that extend from Russia, throughout Europe, and even into the new world, yet the "little" folk traditions remained isolated to smaller geographical areas. It is in this same manner that Carnatic classical music spans the diverse cultures of Tamil Nadu, Kerala, Carnatica, or Andhra Pradesh. Indian dance can be described as an amalgamation of 'nritta' (the rhythmic elements), 'nritya' (the combination of rhythm with expression) and 'natya' (the element of drama). Nritya, when combined with nritta, is featured in most of the stage performances. Nritya comprises of abhinaya that depicts rasa (sentiment) and bhava (mood). To enjoy Indian Dance (Natya or dance drama) thoroughly, one has to understand Indian legends. Indian mythology is predominant amog these dances. The Indian dances also depict the ethos and values of the Indians. One of the popular Indian dance forms is the dance of 'Nataraja' which is popularly called the cosmic dance of lord shiva. Lord Shiva, the King of Dances, predominantly features in the India dance forms. His cosmic dance conglomerates creation, preservation and destruction. Nataraja's dance is the symbolic representation of human life, which depicts that ultimately, the good and the evil are neutralized. In the pose of Nataraja, Lord Shiva holds a small drum (damru) in his upper right hand, while his lower right hand shows the gesture (abhaya), which represents the negation of fear. The upper left hand of Nataraja is in half-moon pose (ardhachandra mudra), which holds a tongue of flame which is the fire (agni) that finally destroys the world and is then quenched in cosmic waters. Nataraja's hand, holding the drum and the one holding fire balance the forces of creation and destruction. The second left arm is held gracefully across the chest (gajahasta mudra) with the hand pointing to the uplifted foot, which denotes favor or grace for the devotee. One foot rests on Apasmara or Mauyalka, the embodiment of human cruelty and ignorance. Surrounding Shiva's figure an immense aureole of flames emanates from him. chandra tArAdi tam namaha svAtvikam shivam! 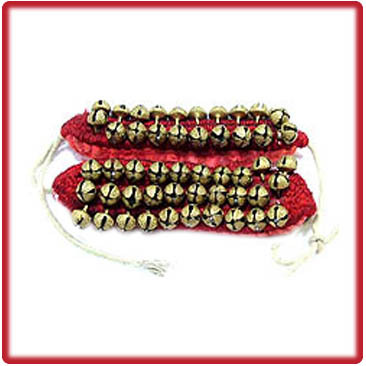 Ghungru is used in the dance performances in India from the ancient times. 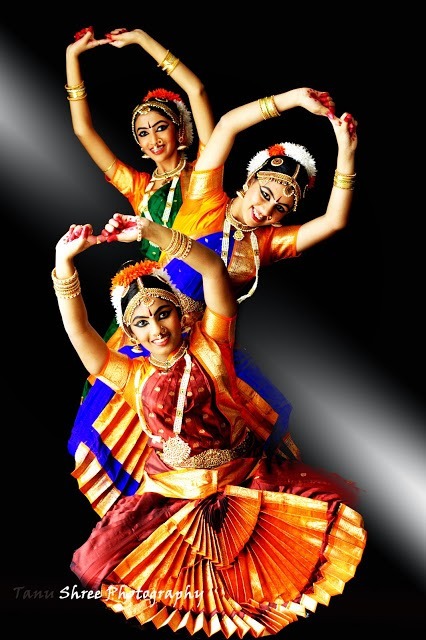 India itself is known for its rich cultural heritage and its aesthetic sense for dance and music. Ghungru is also known as the Dancing Bells. It is wore at the ankles by the dancers. The Ghungroos are very much in use in the Bharatnatyam, Kathak, Kuchipudi, and Odissi performances. The string of Ghungroos are worn just above the ankle by the dancers. The number of Ghungru can vary from fifty to more than two hundred. The number of the Ghungru depends on the expertise of the performers. Generally a dancer in the initial days of her career uses only fifty Ghungroos and gradually keeps enhancing the number. The audience are able to grasp the difficult yet beautiful footwork used by the dancers during a performance. § Maharis were Oriya devadasis or temple girls, their name deriving from Maha (great) and Nari or Mahri (chosen) particularly those at the temple ofJagganath at Puri. Early Maharis performed mainly Nritta (pure dance) and Abhinaya (interpretation of poetry) based on Mantras and Slokas. Later, Maharis especially performed dance sequences based on the lyrics of Jayadev's Gita Govinda. Bhitari Gauni Maharis were allowed in the inner temple while Bahari Gauni Maharis, though in the temples, were excluded from the sanctum sanctorum. § By the 6th century, the Gotipua tradition was emerging. One of the reasons given for the emergence of Gotipuas is that Vaishnavas did not approve of dancing by women. Gotipuas were boys dressed up as girls and taught the dance by the Maharis. During this period, Vaishnava poets composed innumerable lyrics in Oriya dedicated to Radha and Krishna. Gotipuas danced to these compositions and gradually stepped out of the precincts of the temples. § Nartaki dance took place in the royal courts, where it was much cultivated before the British period. At that time the misuse of devadasis came under strong attack, so that Odissi dance withered in the temples and became unfashionable at court. Only the remnants of the Gotipua school remained, and the reconstruction of the style required an archaeological and anthropological effort that has tended to foster a conservative purism. The consecration of females to the service of temple dancing began in the Shaivite temples and continued in the Jagannath temple in service of the Lord Jagannath. These attendants have been known as Maharis (great women) or Devadasis (servants of the lord), and have been considered the wives of Lord Jagannath. Odissi developed through their art. The first evidence of the Mahari institution in Orissa comes from a commemorative inscription by Udyota Kesari, the last King of the dynasty. In the 10thcentury the King’s mother, Kolavati Devi, dedicated temple dancers to Lord Shiva in the Brahmeswara Temple. Raja Anantavarma Chodagangadeva appointed dancing girls for ritual services in the Jagannatha temple in the 11th century, and these Maharis were the ones responsible for keeping the dance alive for centuries. Through the technique of unequal division of weight and firm footwork balancing a fluid upper torso, the dancer achieves a sensuality that is uncommon in other classical dance styles. Some eminent Mahari dancers are Moni Mahari, Dimmi (Domi) Mahari, Dungri Mahari (Harapriya), and Padmashri Guru Pankaj Charan Das. In the Oriya language Gotipua means single boy. Gotipua dance is performed only by boys who dress up as females. During the rule of King Prataprudra Dev, who was a follower of Sri Chaityana, renewed this dancing tradition by boys, as the Vaishnavas did not approve of dances by females. An invocation piece. After paying homage to Lord Jagannath a shloka (hymn) in praise of some God or Goddess is sung, the meaning of which is brought out through dance. Mangalacharan also includes the Bhumi Pranam (salutation to Mother Earth) which is offered to Mother Earth as a way of begging forgiveness for stamping on her and the Trikhandi Pranam or the three-fold salutation - above the head to the Gods, in front of the face to the gurus and in front of the chest to the audience. Also known as Sthayee Nrutya or Batuka Bhairava (Furious Dance) it is performed in the honor of Lord Shiva- the cosmic Lord of Dance. It is one of the 64 furious-aspects of Lord Shiva known. The origin of dance is believed to be from Tantrism that had flourished in Orissa. Linga Purana andMahanirvanatantra give an elaborate description of Batuka Bhairava in three aspects, and the results of their worship have also been explained elaborately in the texts. Battu Nrutya is an item of pure Nrutya (Dance)and remains the most difficult item of Odissi dance. 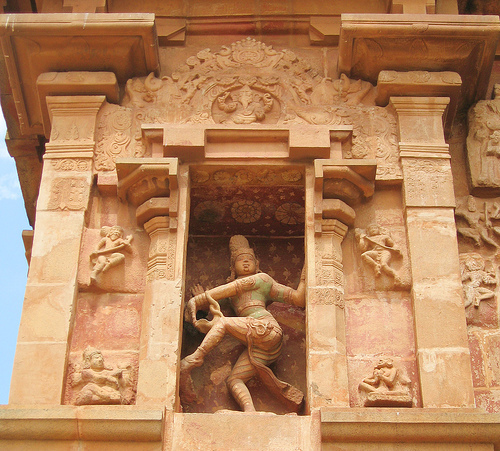 The dance begins with a series of sculpturesque poses depicting such actions as the playing of a Veena (Lute), Mardala or Pakhawaj (Drum), Karatala (Cymbals) and Venu(Flute), that brings out the interrelationships between this dance and the dance sculptures adorning the temples of Orissa. These poses are stringed together with steps in different rhythms. There is no song or recitation accompanying the dance, but throughout the item a refrain of rhythmic syllables is provided. The accompanying refrain is in the form of one line of Ukuta and as this is recited in the Tala, different Jathi-patterns are improvised and are executed with the feet. Some Tala variations are introduced and each sequence of the dance terminates with a Tehdi known as Katam. The last sequence is always in Jhula Pahapata Tala and is performed with a fast tempo. A pure dance item in which a raga is elaborated through eye movements, body postures & intricate footwork. Pallavi literally means “blossoming”. This is applicable not only to the dance, but also to the music, which accompanies it. Pallavi starts with slow, graceful & lyrical movements of the eyes, neck, torso & feet & slowly builds in a crescendo to climax in a fast tempo at the end. Both the dance and the music evolve in complexity as the dancer traces multiple patterns in space, interpreting the music dexterously in the multilayered dimensions of taal (rhythm) and laya (speed). An expressional dance which is an enactment of a song or poetry, where a story conveyed to the audience through mudras (hand gestures), bhavas (facial expression), eye movement and body movement. The dance is fluid, very graceful, and sensual. Abhinaya can be performed on verses in Sanskrit or Oriya language. The verses are extremely ornate in content and suggestion. Most common are Abhinayas on Oriya songs or Sanskrit Ashthapadis or Sanskrit stutis like Dasavatar Stotram (depicting the ten incarnations of Lord Vishnu) or Ardhanari Stotram. Most of the Abhinaya compositions are based on the Radha-Krishna theme. The Astapadis of the kãvya Gita Govinda written by the Saint Jayadev are an integral part of its repertoire. The beginning pieces are dedicated to Lord Jagannath - an incarnation of Lord Vishnu. Usually longer than Abhinaya and typically performed by more than one dancers. Some of the much appreciated dance dramas composed by Guru Kelucharan Mahapatra are: Sudama Dharitra Bhanjana, Mathamani Pradhana, Balya Leela, Rutu Samhara, Krishna Sudama, Dushmanta Sakuntala, Utkala Mauda Mani, Yagnaseni, Meghadoot, Kumara Sambhava, Sapan Nayaka. Usually Hindu mythologies are chosen as themes, but experimenting with the theme and form in recent years have led to extremely unique creations. Some worth-mentioning themes in recent years are Panchakanya, Ganga Yamuna, Shrita kamalam, Mrutyuh and Tantra. The concluding item of a recital. Moksha means “spiritual liberation”. This dance represents a spiritual culmination for the dancer who soars into the realm of pure aesthetic delight. Movement and pose merge to create ever new patterns, ever new designs in space and time. The dance moves onto a crescendo that is thrilling to both, the eye and the ear. With the cosmic sound of the “Om”, the dance dissolves into nothingness — just like Moksha or the deliverance of the soul in real life. It is the opening section of a typical Indian classical performance. It is unmetered, improvised (within the raga) and unaccompanied (except for the drone of the Tanpura), and is started at a slow tempo. Hide category of the 4 musical divisions, e.g. Mardala or Pakhawaj (Drum), Tabla, and Mridangam. Sound created by striking the Mardala or Pakhawaj (Drum) with one hand. One complete cycle of a taal. Odissi term used to describe the spoken drum neumonics. During dance performances Bani are spoken by the percussionist or the guru. In taal, this would be the groups the taal is divided into. Also the points on which the tali, or khali would be. e.g., Adital (Odissi) is divided into 4 groups of 4 beats. It is said that Adital has 4 Bhago. These are the measures. Odissi music term. It is any type of Indian devotional song. It has no fixed form: it may be as simple as a Mantra or Kirtan or as sophisticated as the Dhrupad or Kriti with music based on classical Ragas and Talas. It is normally lyrical, expressing love for the Divine. In tal, this would be how the divisions of the tal are divided. e.g., in Adital (Odissi), the sixteen beats are divided into 4 groups of 4. So the Chanda for Adital is 4 + 4 + 4 + 4. This describes what the Bhagas are. They were the original temple dancers who were "Servitress of God". They were dedicated to a deity or a temple. Apart from taking care of the temple and performing various rituals, these women learned and practiced Odissi dance, for dance and music were an essential part of temple worship. They enjoyed a high social status. Poet Jayadev's famous work depicting the relationship of Radha, Krishna and Gopis in Vrindavan. Themes from this work have a great significance towards the classical arts of India. These are barrel-shaped tension pegs made of wood which adorn the Mardala or Pakhawaj (Drum). The straps (Pitha) connecting the two apertures of the Mardala run over them. These pegs can be moved to either increase or decrease the tension of the leather membranes covering the two apertures of the Mardala and are useful in tuning it. When bani and ukuttas are formed together to make phrases. e.g., Kititaka gadigana. Odissi term. The ending sequence that is repeated to designate that the ending of the piece or of a section. Typically in 3 repeats. Odissi term. People in Orissa inter change Tihai and Mano. But they mean the same. The original temple dancers of Orissa, but now extinct. This is the root of Odissi dance that was later taught to young boys, Gotipuas. The style is now modernized and work is being done to preserve it. Odissi dance is accompanied by Odissi music, a synthesis of four classes of music, i.e. Dhruvapada, Chitrapada, Chitrakala and Panchal. The Dhruvapada is the first line or lines to be sung repeatedly. Chitrapada means the arrangement of words in an alliterative style. The use of art in music is called Chitrakala. Kavisurya Baladeva Rath, the renowned Oriya poet wrote lyrics, which are the best examples of Chitrakala. All of these were combined to form the style that's peculiar to Odissi music. Chhanda (metrical section) contains the essence of Odissi music.The Chhandas were composed by combining Bhava (theme), Kala (time), and Swara (tune). 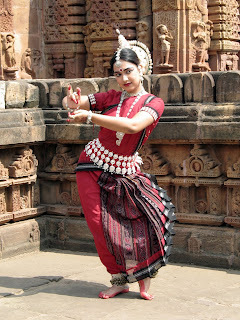 The Chaurisha represents the originality of Odissi style. All the thirty four (34) letters of the Oriya alphabet from 'Ka' to 'Ksha' are used chronologically at the beginning of each line. A special feature of Odissi music is the padi which consists of words to be sung in Druta Tala (fast beat). Odissi music can be sung to different talas: Navatala (nine beats), Dashatala (ten beats) orEgartala (eleven beats). Odissi ragas are different from the ragas of Hindustani and Karnataki classical music. The primary Odissi ragas are Kalyana, Nata, Shree Gowda, Baradi,Panchama, Dhanashri, Karnata, Bhairavee and Shokabaradi. Odissi music is sung through Raganga, Bhabanga and Natyanga Dhrubapadanga followed by Champu, Chhanda, Chautisa, Pallabi, Bhajan, Janana, and Gita Govinda, which are considered to be a part of the repertoire of Odissi or an allied act form of Odissi. Odissi music has codified grammars, which are presented with specific Raagas. Ithas also a distinctive rendition style. It is lyrical in its movement with wave-like ornamentation. The pace of singing in Odissi is not very fast nor too slow, and it maintains a proportional tempo which is very soothing. The jewelry is made from intricate filigree silver jewelry pieces. Filigree, in French, means “thin wire,” and in Oriya it is called Tarakasi. This highly skilled art form is more than 500 years old and is traditionally done by local artisans on the eastern shores of Orissa. The jewelry pieces themselves are an important part of the Odissi dancer’s costume. They are the tikka (forehead ornament),allaka (head piece on which the tikka hangs), unique ear covers in intricate shapes, usually depicting a peacock’s feathers, with jimkis (bell shaped earrings) hanging from them, two necklaces- a smaller necklace worn close to the neck and a longer necklace with a hanging pendant, and two sets of bangles worn on the upper arm and wrist. The process of creating each piece takes the collaboration of many artisans each specialized in one step of the many that turns a lump of raw silver into a handcrafted work of art. The crown or Mukoot or Mookut, worn by the Odissi dancer is made only in the devotional city of Puri in Eastern Orissa. It is formed from the dried reeds called Sola in a tradition called Sola Kama. The reed is carved by a series of cuts into the rod-like stem and forms various types of flowers when a string is tied in the middle of the rod and pulled tight. As the string is tightened, the flowers shape into Jasmines, Champa (one of the five flowers of Lord Krishna’s arrows), and Kadamba (the flowers of the tree under which Radha would wait for her beloved Lord Krishna). The Mukoot consists of two parts i.e. Ghoba and Tahiya. The flower decorated back piece, called the Ghoba, sits around the dancer’s hair pulled into a bun at the back of the head. This piece represents the Lotus flower with a thousand petals that lies above the head in the head Chakra, or energy center. The longer piece that emerges from the center of the back piece is called the Tahiya, and this represents the temple spire of Lord Jagannath or the flute of Lord Krishna. The Saree worn by Odissi dancers are generally coloured with bright shades of orange, purple, red or green. This Saree features traditional prints of Orissa and shiny embellishment. This costume is drapped around the body in unique traditional way unlike other classical dance forms of India. Generally Sambalpuri Saree is being used in Odissi dance more than any other type of Sarees. The makeup of an Odissi dancer includes Bindi (red dot), applied on the forehead with a pattern made from sandalwood around it, Kajal (black eyeliner), applied around the eyes with a broad outline to give them an elongated look, among others. Padma Vibushan Kelucharan Mohapatra, Guru Pankaj Charan Das, Guru Deba Prasad Das and Guru Raghunath Dutta were the four major gurus who revived Odissi in the late forties and early fifties.Sanjukta Panigrahi, the great exponent of Odissi, was a leading disciple of Guru Kelucharan Mohapatra's and popularized Odissi by performing extensively, both in India and abroad. In the mid-sixties, two other disciples of Kelucharan Mohapatra, Kumkum Mohanty and Sonal Mansingh, were best known for their performances, both in India and abroad. Shrimati Laximipriya Mohapatra performed a piece of Odissi abhinaya in the Annapurna Theatre in Cuttack in 1948. This is widely upheld as the first ever performance of a classical Odissi dance item after its contemporary revival. 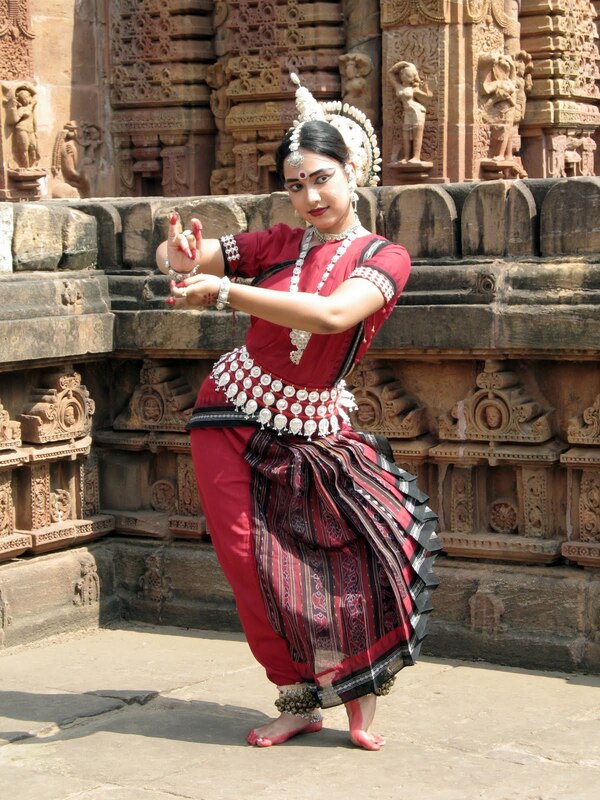 Padma ShriMayadhar Raut also played a major role in giving Odissi dance its classical status. He introduced Mudra Vinyoga in 1955 and Sancharibhava in the Odissi dance items, and presented on stage the enchanting Gita Govinda Ashthapadis, portraying Shringara Rasa. His notable compositions include Pashyati Dishi Dishi and Priya Charu Shile, composed in 1961. Most of the present day gurus were Gotipua dancers themselves, and have trained dancers and teachers all over India and abroad. In the early fifties, the outside world began to take note of Odissi. Priyambada Mohanty Hejmadi and Dr. Susama Tej represented Orissa in the classical dance category at the Inter University Youth Festival, New Delhi, in 1954 and 1955. It was here that Dr. Charles Fabri witnessed their performances, hailed Odissi as a great classical dance form, and helped Indrani Rehman and Sonal Mansingh study it. Sadly, Priyambada Mohanty Hejmadi left for the US for 16 long years, where she hardly performed, barring a recital or two here and there. She returned to India only in the mid-nineteen seventies, by which time well known dancers had already occupied a permanent and prominent space on the Odissi horizon, and by which time Odissi had evolved considerably. The baton in India was wielded gloriously, and with outstanding success and public acclaim, by Sanjukta Panigrahi, Kumkum Mohanty and Sonal Mansingh, each of whom was a major and distinctive star. Kelucharan Mohapatra, Pankaj Charan Das, Deba Prasad Das, Raghunath Dutta, Bandana Das, Cuckoo Meena Mohanty, Dr. Nandita Samuel, Kumkum Mohanty, Mayadhar Raut, Minati Misra, Oopali Operajita, Protima Bedi, Ritha Devi, Sanjukta Panigrahi, Sonal Mansingh and Surendranath Jena contributed notably to the propagation of Odissi, starting in the fifties, right up to the eighties and nineties: the golden years of the Odissi renaissance. Eminent contemporary gurus and performers in alphabetic order include Aloka Kanungo, Aruna Mohanty, Bichitrananda Swain, Bijayini Satpathy, Chitralekha Patnaik, Daksha Mashruwala, Dibakar Khuntia, Dr. Bidisha Mohanty, Durga Charan Ranbir, Gangadhar Pradhan, Gita Mahalik, Harekrishna Behra, Ileana Citaristi, Jhelum Paranjape, Jyoti Rout, Kasturi Pattanaik, Kiran Segal, Kumkum Lal, Madhavi Mudgal, Madhumita Raut, Manoranjan Pradhan, Meera Das, Muralidhar Majhi, Nandita Behera, Natabar Maharana, Oopali Operajita, Poushali Mukherjee, Ramani Ranjan Jena, Ramli Ibrahim, Ranjana Gauhar, Ratikant Mohapatra, Ratna Roy, Sharmila Biswas, Sharmila Mukherjee, Sharon Lowen, Snehaprava Samantaray, Sonal Mansingh, Sri Mahdeva Raut, Srinath Raut,Sujata Mohapatra, Surupa Sen, Sutapa Talukdar, Trinath Maharana and several others around the world. Some of the upcoming Odissi performers in alphabetic order are Aadya Kaktikar, Arushi Mudgal, Ayona Bhaduri, Bani Ray, Bijay Sahoo, Devraj Patnaik, Ellora Patnaik, Kaustavi Sarkar, Kavita Dwivedi, Lingaraj Pradhan, Madhusmita Mohanty, Masako Ono, Niharika Mohanty, Pabitra Kumar Pradhan, Puspita Mishra, Rahul Acharya, Rajashree Chintak Behera, Rajashri Praharaj, Rajika Puri, Ramesh Chandra Jena, Rekha Tandon, Sandhyadipa Kar, Saswat Joshi, Saswati Garai-Ghosh, Shibani Patnaik, Shipra Avantica Mehrotra, Shreelina Ghosh, Sonali Mishra, Sreyashi Dey, Vishnu Tattwa Das, Yudhistir Nayak and several others around the world.